Gunnar Oom is State Secretary to Minister for Trade Ewa Björling. He has served in this position with the Ministry of Foreign Affairs since November 2010. Prior to his appointment, he served as Mayor and Chairman of the Municipality Board ofDanderyd, Sweden from 2003-2010. Mr. Oom has held a number of positions within the private sector in Sweden, including Business Developer and Chief Investment Manager, with NCC BOT; Director, Project Finance, with Vattenfall AB; Managing Director, Idhammar System; and Managing Director, SveaBanken. He speaks English, German and Russian. We welcome you to an evening to celebrate the Nordic community in Seattle and to learn more about the Nordic business culture with our extraordinary panel consisting of Nordic consuls and prominent business leaders. 6:00 pm-6:45 pm Networking and exhibition: Eight Seasons in Sápmi, the Land of the Sámi People. Panel topic: Business practices here in the Pacific Northwest as compared to those of the Nordic countries, synergies and dissonances. Panel: Honorary Consul of Norway Kim Nesselquist, Honorary Consul of Finland and President, Finnish-American Chambers of Commerce Matti Suokko and Honorary Consul of Sweden Lars Jonsson. in order to facilitate for catering! Price: $20 SACC-Seattle members/ $25 Non members (Lunch buffet included) Payment in cash or check. 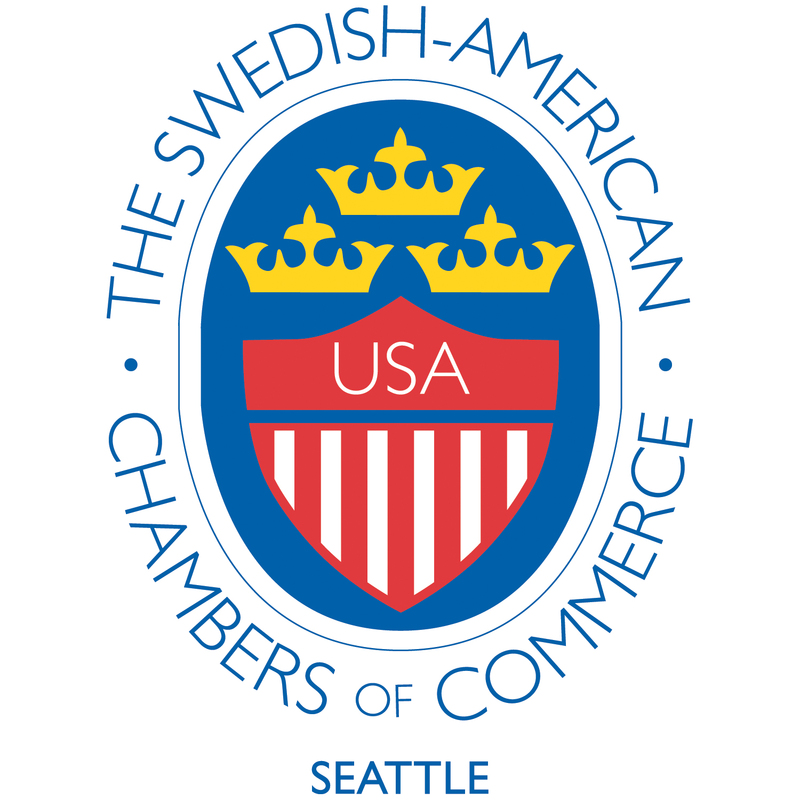 Consulate of Swedenand SACC-Seattle invites you for an afternoon of foreign policy discussion at the SwedishCulturalCenter. With us, we have the Swedish, Middle Eastern expert, Mr Trita Parsi. Based in WashingtonDC, Mr Trita Parsi is in Seattleon brief visit to talk about his latest book “A Single Roll of the Dice - Obama's Diplomacy with Iran”. Mr Trita Parsi will devote the lunch to talk about the most recent events inIranandIsrael, the escalating threat of military action and the implications forUSAin the middle of pending presidential election. We will end the session with open floor questions to Mr Parsi. Don’t miss out on this extraordinary occasion! Trita Parsi is the 2010 recipient of the Grawemeyer Award for Ideas Improving World Order. He is the founder and president of the National Iranian American Council and an expert on US-Iranian relations, Iranian foreign policy, and the geopolitics of the Middle East. He is the author of Treacherous Alliance: The Secret Dealings of Iran, Israel and the United States (Yale University Press 2007) as well as his latest book -A Single Roll of the Dice - Obama's Diplomacy with Iran (Yale University Press 2012). Parsi has followed Middle East politics through work in the field and extensive experience on Capitol Hill and at the United Nations. He is frequently consulted by Western and Asian governments on foreign policy matters. Parsi has worked for the Swedish Permanent Mission to the UN, where he served in the Security Council, handling the affairs of Afghanistan, Iraq, Tajikistan and Western Sahara, and in the General Assembly's Third Committee, addressing human rights in Iran, Afghanistan, Myanmar and Iraq. Parsi studied for his Doctoral thesis on Israeli-Iranian relations under Professor Francis Fukuyama at Johns Hopkins University School of Advanced International Studies. In addition to his PhD, he holds a Master's Degree in International Relations from Uppsala University and a Master's Degree in Economics from the Stockholm School of Economics. He has served as an adjunct professor of International Relations at Johns Hopkins University SAIS, an adjunct scholar at the Middle East Institute and as a Policy Fellow at the Woodrow Wilson International Center for Scholars in Washington DC (http://www.tritaparsi.com/ ). Don’t miss the largest Young Professionals event of the year! SACC-Seattle, July 17th: A unique opportunity to hear a world renowned breast cancer MD! SACC-Seattle welcome you to listen to a world recognized expert in his field of medicine, Bruce Porter MD. 6:30PM Tuesday July 17th at the Swedish Club as part of the SACC-Seattle speaker series. Bruce will share review the tremendous advances in this field of medicine over the last two decades. Breast cancer is a topic that impacts us all, either directly or indirectly and with Bruce’s passion and knowledge it promises to be an evening to remember. Physicians from around the world travel to Seattle to learn from Bruce and attend his seminars. Bruce has also travelled to many countries around the world to present his techniques and findings. We encourage you to bring your spouse and friends for this presentation. The presentation will begin at 7pm to be followed by a Q&A sessions. The evening is expected to end by 8:15pm. Swedish Club is opening the bar specifically for this event (no host). Bruce A. Porter, M.D., FACR is a co-founder and medical director of First Hill Diagnostic Imaging in Seattle, Washington. Established in 1984, FHDI was the first facility in the Pacific Northwest to provide Magnetic Resonance Imaging services. In 2007, First Hill Diagnostic Imaging became a joint venture with Swedish Medical Center. Dr. Porter received a B.S. in Medicine from University of North Dakota, School of Medicine. He then went on to complete his medical degree at University of California-Davis. Dr. Porter’s residency training includes Nuclear Medicine atStanford University and Diagnostic Radiology at UC Davis. In 1981, Dr. Porter also completed a Fellowship in abdominal imaging, angiography, and interventional radiology at the University of Lund, Sweden. Dr. Porter has a long-standing specialty interest in imaging, diagnosis and staging of a variety of cancers. For the past 20 years his primary focus has been on developing techniques for advanced imaging of breast cancer particularly with MR imaging. Bruce has published numerous scientific papers and is the author of multiple book chapters, scientific exhibits, as well as presenting more than 400 lectures at national and international scientific meetings. Dr. Porter lives on a boat in Seattle with his wife and first mate, Sharon Vaughn. He has three grown boys, all of whom speak Swedish fluently. 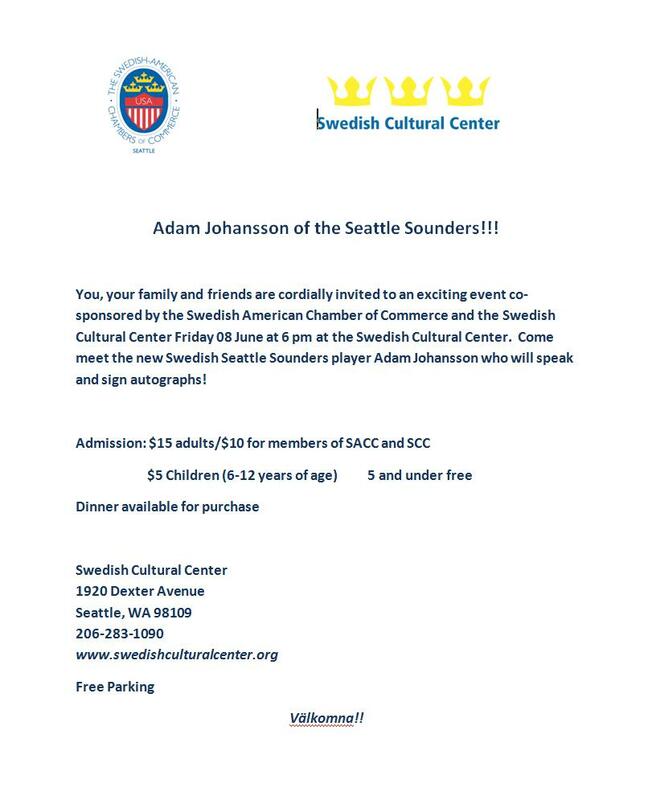 Adam Johansson of the Seattle Sounders!!! We are delighted to announce that this year’s annual meeting will take place at the brand new facilities of SwedishHospital in Issaquah. The Issaquah Swedish Hospital campus has since its opening in July 2011 received remarkable attention both nationally and internationally for its innovative infrastructure that combines the latest technology with an environmentally friendly design. The evening will begin at 6 pm with some light refreshments and a social mingle followed by opening remarks and tour of the Hospital by Swedish’s Chief Executive of Suburban Hospitals, Mr Marcel Loh. We will start off the annual meeting with a presentation by the interim board of directors and by the end of the evening a new board of directors will be elected. 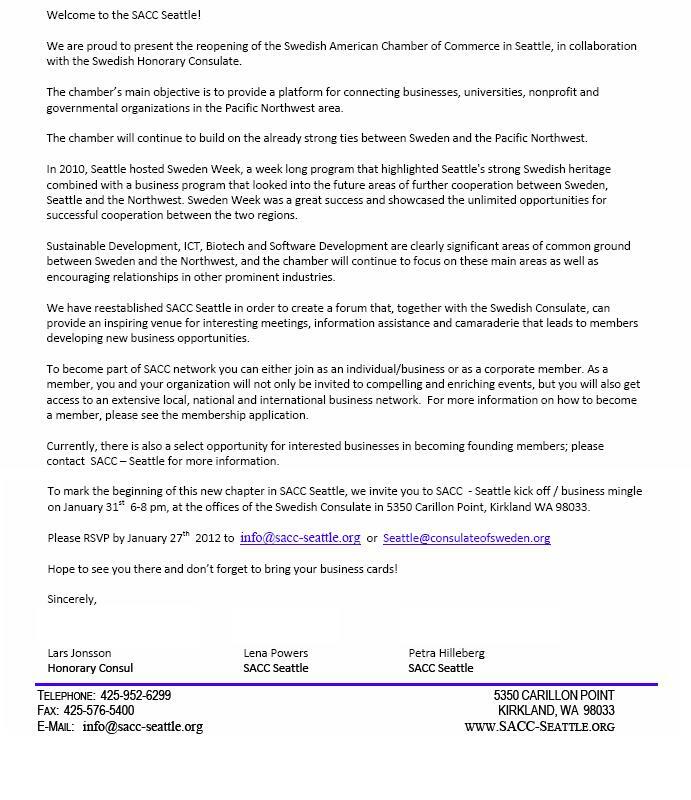 This meeting is open for all but only current members of SACC-Seattle are eligible to vote and to be voted in to the board of directors. Opportunities for membership will be available on site. Call for Executive Board of Directors! We are looking for a few enthusiastic and motivated people to join our board of directors. Welcome to a breakfast meeting at the Swedish Consulate! Living and working in the US is inspiring as well as challenging. We all want to obey the law but it is sometimes hard to understand what applies to us and where to look for help. The new US Foreign Account Tax Compliance Act (FATCA) coming into effect July 1, 2013 will change the way Swedish financial institutes are sharing and are able to provide services to Swedish citizens living and working in the US. 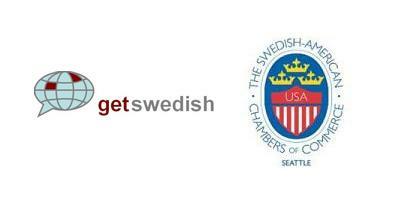 On February 28th, from 8.30 am to 10am, Getswedish in collaboration with the The Swedish Consulate and Swedish American Chamber of Commerce Seattle has invited Madeleine Thunström, a Swedish tax lawyer from SEB to participate via video conference to help us explain how this will effect entrepreneurs or individuals with Swedish or dual citizenship currently living in the US. The setting will be informal and a light breakfast will be served. Preparation for moving from US to Sweden from a Swedish perspective. Properties and other assets in Sweden and the responsibility of the individual. The cost for this meeting is $10 for SACC members and $15 for non members. Space is limited, so please RSVP to seattle@consulateofsweden.org and send in a check to the Swedish Consulate 5350 Carillon Point, Kirkland, WA98033 by February 24.